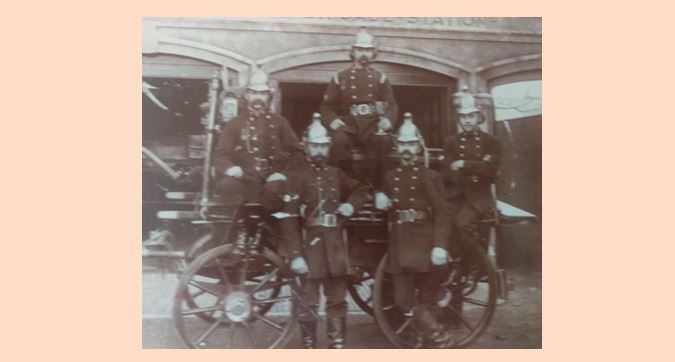 Second Officer Charles Jolliffe Dennett of Sandown Fire Brigade passed away 15 August 1926 aged 70 (pictured above in the centre holding the trophy). Charles was born in 1856 and was Christened in Brading on 2 November. According to the 1881 census returns he was still resident in the village at that date, although this conflicts with his membership of the Sandown brigade from 1880. He married Jane on Christmas Day 1884 and they lived in what was described in the 1891 census as 'rooms at the back of the Town Hall' in Grafton Street and earned his living as a carpenter/joiner. The 1901 abode description was identical but by 1911 this was noted more formally as Town Hall Cottage where in addition to his trade he was the Town Hall caretaker (since at least 1889 according to Kelly's Directory). In addition to his brigade service, in which he was to prove highly efficient, he was also a member of the Island's Rifle Volunteers, earning the long service medal. In the mid 1880's on two consecutive occasions he won an annual one-man drill competition held in the pre-IWFBF days. In later IWFBF and NFBU competitions he was a successful competitor and team leader. The First World War exacted a tragic cost from the Dennett's as Charles and Jane suffered the loss of their two eldest sons in the conflict. The eldest Douglas, perished in service with the 4th Battalion, Leicestershire Regiment on 31 August 1914 and the other Hugh, who before War service had followed his fathers footsteps in to the brigade, was killed on 18 October 1918 serving with the Royal Army Medical Corps. When Chief Officer Dore resigned from the Brigade in 1916 his natural replacement, Deputy Chief Dr Billups, was away serving in the War so Charles, by then Second Officer, was appointed Acting Chief. Charles fulfilled the role until asking to be relieved of it in November 1918. There's no proof but having asked to be relieved of the role within a few weeks of his second son's death in the War it's not difficult to appreciate why he may have made that decision. Charles's brother William assumed the role until Billups returned in 1919. At the time of Dr Billups return William was appointed permanent Second Officer and it seems that Charles had resigned from the service. However he was asked to keep his uniform and accoutrements and remain as a supernumerary fireman, a role he maintained until his death. He died at home, Town Hall Cottage, on Sunday 15 August and his funeral of the following Wednesday saw his coffin bearers were former Brigade colleagues; Chief Officer H.B. Billups, Second Officer W.H. Brown and Firemen A.F. White, H. Draper, B. Holbrook with Honorary Fireman F. White. Rest in peace Second Officer Dennett.